PAS-stained sections from C3KI mice aged 14–28 days. Images are representative of the 8 C3KI mice examined. Arrows highlight key examples of the following: (A) Mesangiolysis in the glomerulus. 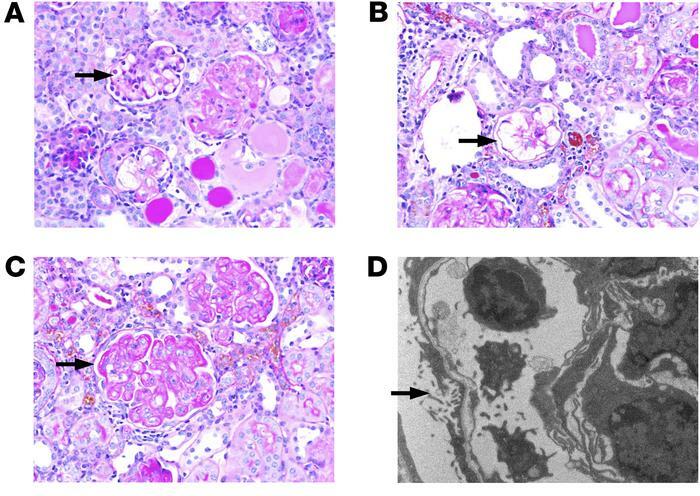 (B) Microaneurysms of the glomerular capillaries following dissolution of the matrix after the mesangiolysis. (C) Double contouring of glomerular capillary walls, a key feature of chronic TMA. Original magnification in A–C, ×40. (D) Electron microscopy (original magnification, ×7900) showing subendothelial lucency, which is consistent with ischemic conditions precipitated by the TMA from a day 7 C3KI mouse.